This suggests that the conditional probability of being struck by lightning depends on your gender. You might think that the conditional probability of being struck by lightning for a man is four times higher than four a woman. Not so fast. 1. Men are more likely to be outside. 2. More are more likely to have jobs that require them to work outside. The second two would affect the conditional probability of being struck by lightning given one’s gender and that he/she is in a thunderstorm. 3. Men take more risks than women. 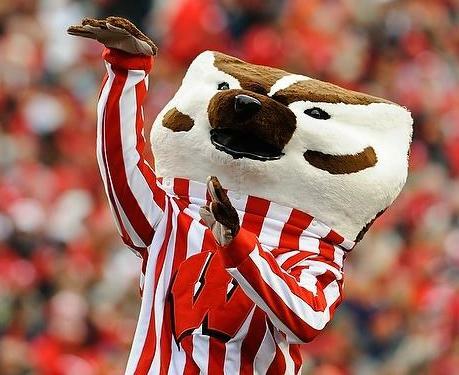 “If you look at the percentage of men who take part in high risk sports that might give you an idea,” said Buchanan. Therefore, a man would be less likely to go inside during a thunderstorm. 4. Men don’t want to be seen as “wimps.” This theory, she said, was backed up by talking to the Boy Scouts who said no one wants to be the one to say it’s time to go inside. 1 < [Conditional probability of being struck by lightning given that one is a man and is in a thunderstorm] / [Conditional probability of being struck by lightning given that one is a women and is in a thunderstorm] < 4. However, I can say right off the bat that there isn’t going to be one right answer. There is substantial variation in both the microphysics and dynamics of moist convective systems. As a result, there is wide variation in the lightning frequency from different storms. Take, for example, so-called MCS’s (Mesoscale Convective Systems) that originate on the Front Range of the Rockies and propagate eastward in the nighttime hours, eventually affecting places like MSP, MSN, or ORD in the morning hours. These are profligate lightning generators, often producing essentially continuous lightning. Meanwhile, a completely different animal from MCS’s are baroclinic frontal convective systems. Often these will pass through with only occasional lightning (occasional lightning is officially defined by the weather service as no more than once every 2 minutes). Then, perhaps most interesting of all, there are some storms that generate copious cloud-to-cloud or cloud-to-air lightning but very little cloud-to-ground lightning. The specific reasons for the wide variation in lightning frequency and type are still the subject of research (we have generally poor observations of microphysical processes, especially those processes in violent convective storms). So, the type of storm will affect your conditional probability of being struck by lightning. My brother-in-law also helped me to compute the probability of being struck by lightning conditioned on whether there is a storm. We need to estimate values for P(S|L), P(L), and P(S). P(S|L) is easy; It’s 1 (you can’t have lightning without a storm). Estimates for P(L) and P(S) can be obtained from the public sphere. 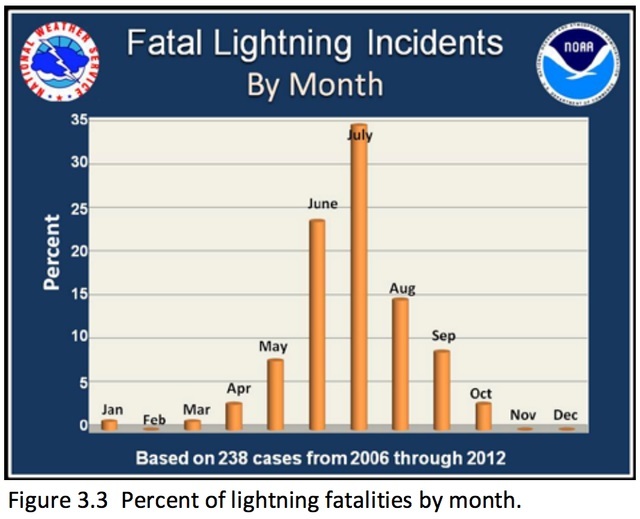 A little searching reveals that ~ 400 people per year are struck by lightning. If we assume the strike incidents are independent and uniformly distributed across the 365 days of the year, then the number of people struck on any given day is roughly 400/365. An estimate for P(L) for any given day is then the number of people struck on any given day divided by the total US population. Using 310 million as the US population we get P(L) for any given day is (400/365) / (310×10^6) = ~ 3.5 x 10^(-9). (assuming that P(S | L, O) = P(O | L) = 1 for our purposes). However, this is problematic, since estimates for P(L) (like the one that my brother-in-law reports above) implicitly capture the likelihood that people are outside, P(L | O, S). This is circular reasoning. If you can shed additional light on this problem, please leave a comment. There is not nearly enough information available on the Internet on the conditional probability of being struck by lightning. I think of the odds of being struck by lightning and conditional probability every time I am in a thunderstorm. 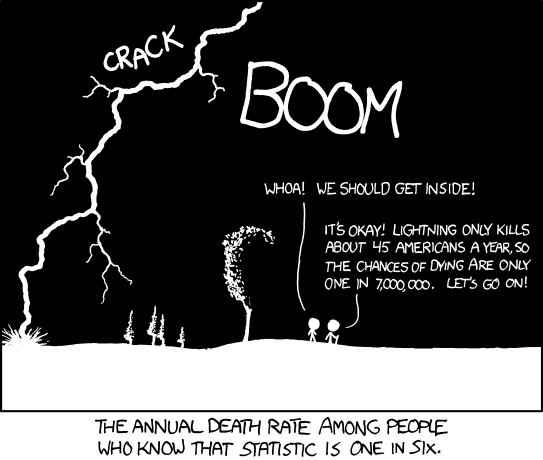 The conditional probability of being struck by lightning is probably not 1 in 6. NOAA estimates that the (unconditional) probability of being struck by lightning is ~1 in 1,000,000 per year and ~1 in 10,000 over a lifetime. That’s of little solace when I’m out running a few miles from home when a thunderstorm rolls in. Jeffrey Seth Rosenthal’s book Struck by Lightning does not exactly answer this question. He does, however, report the annual probability of being struck by lightning conditioned on where on lives. Below are the figures from his book on the most dangerous states, the safest states, and the most dangerous countries (at least in terms of being struck by lightning). The “Annual Rates” report the expected number of people struck by lightning per year per 100,000. This could be due to differences in the prior probabilities (some areas have more thunderstorms than others) or in attitudes toward risk in thunderstorms. Any idea of what the conditional probability of being struck by lightning would be given that one is outside in a thunderstorm? I need to know how much to panic the next time a thunderstorm rolls in when I am running. There is a part II, part III, and part IV to this series.